Wow – what a brilliant tune. 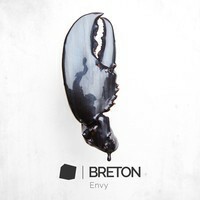 “Envy” is the first single lifted off Breton’s forthcoming second album, ‘War Room Stories’, and what a stonker this track is. “Envy” is what indie-rock is all about. Most reminiscent of Foals circa ‘Antidotes’, “Envy” also hints at other subtle influences. For instance, the song’s ever-so-catchy, hook-laden chorus recalls Athlete circa ‘Beyond The Neighbourhood’. “Envy” is choc-full of interesting quirks and effects, math-y rhythms, and a seemingly ever-evolving arrangement, all driven by a high-energy, danceable beat. It’s instrumentation is also quirky – for example, the song’s main melody the the South London quintet pair angular indie guitars with errrr, timpani of course! During the verses, a funk-driven bass line combines with piano briefly giving the song a smooth and timeless, slightly-lounge, slightly 70’s funk, vibe. In fact, piano is oddly one of foundations of “Envy” and it works a treat. The calypso flavoured section around 1:30 adds another curiosity, as do the choppy violins around 2:30. The single ‘Envy’ will be released on 24 January, 2014 on the band’s own imprint label Cut Tooth, through Believe Recordings while the album, ‘War Room Stories’, is set for release on 4 February, 2014. Pre-order the album now.